Armed US Diplomats Detained at Peshawar Toll Booth: What Was Mission? Google map showing Malakand University (missing "A" label at top right), Chamkani Police Station (B) and Bara (C). Driving time from Malakand University to Chamkani Police Station is given as about two and a half hours, while it is only a half hour to Bara from the police station. Four US diplomats and their three Pakistani employees were arrested and shifted to the nearby Chamkani police station. An FIR was registered against the three Pakistanis under Section 13 of the Arms Ordinance, while the US diplomats were released after hours-long negotiations between SP Shafeeullah Khan and US Consul General in Peshawar Marie Richard. The police intercepted two bullet-proof vehicles of the US consulate on the motorway in Peshawar and found four pistols, four SMG rifles and several ammunition magazines in their possession, Chamkani police station’s SHO Haji Inayatullah told The Express Tribune. Inayatullah identified the four diplomats as Vincent Capodicci, Timothy Daniel, Leon Carter and Daryal Lee Groom. The arrested Pakistanis were security in-charge Manzoor and drivers Ihsan Khan and Asif Khan. Police said the Americans were taken into custody along with their vehicles during examination on a Motorway checkpost when they were on their way to Peshawar from Malakand University. Malakand University is quite small and moderately isolated. It is hard to understand why diplomats would be visiting there. 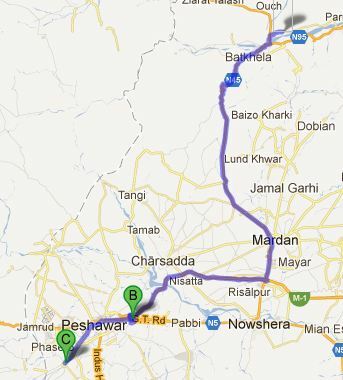 The “nearby” Chamkani Police Station where the diplomats were taken from the toll plaza area is on the most direct route back into Peshawar from Malakand University, which is to the north and east. Dawn and the Express Tribune differ on both the number of and names of the diplomats detained. The list of four names above is from the Express Tribune, while Dawn claims only two were detained, “Daniel and Levan”. The “Levan” name does not appear in the Express Tribune list of names, which does include “Timothy Daniel”. Taken together then, the two articles implicate anywhere between two and five Americans being in the vehicles. If we assume that the University is just a cover location, then what was the real purpose of the trip? Two possibilities come to mind in light of recent events. The trial and imprisonment of Dr. Shakeel Afridi has upset many in the US, and so it is possible that this was indeed a diplomatic trip and that it was aimed at securing the release of Afridi. The problem with that explanation, though, is that Afridi’s trial was carried out in Bara, which is on the western outskirts of Peshawar, rather than the easern side where the diplomats were detained. Further, it appears that Afridi is now jailed in Peshawar’s central jail, so it would not be necessary to leave Peshawar to visit with Afridi or his local jailers. The State Department’s Rewards for Justice program had set a $1 million reward for information leading to al-Libi, who had filmed numerous propaganda videos urging attacks on U.S. targets after he escaped a prison at Bagram Air Base in Afghanistan in 2005. The significance here is that this is described as a State Department program and the diplomats who were detained presumably work for the State Department. Of course, anyone traveling through Pakistan’s tribal areas with a million dollars in cash would be well-advised to travel in “bullet-proof vehicles” and to be heavily armed. Arguments against this explanation are that at least on the official news front, it is not yet clear whether al-Libi was indeed killed and that North Waziristan is considerably to the west and south of Peshawar, instead of north and east where Malakand University is located. At any rate, since shooting did not break out this time, we are likely not to hear more about this event and whether these were indeed State Department employees or CIA agents working to gather intelligence such as locations of high value targets for drone strikes. Al-Libi’s death would be “another reason not to accept Pakistan’s demand for an end to drone wars,” added Brookings Institute’s Bruce Riedel, a former CIA officer and adviser to the White House on Afghanistan and Pakistan policy. In the wake of a New York Times article laying out how Obama personally guided the drone war on Pakistani soil, Khar criticized the use of drones as counterproductive. “If you are creating 10 more targets for every target you take, are you doing a service or a disservice to your eventual goal of winning the war?” she asked. Update: From a comment by Marcia Anglerill: I am the Public Affairs Officer at US Consulate General in Peshawar and I can tell you exactly what the “mission” was. It was to organize an inauguration ceremony for an English language program at Malakand University. This program gives scholarships to economically underprivileged students to participate in a 2-year intensive after school program to improve their English skills, thereby giving them a better chance to pursue higher education and secure a better job in the future. The Americans who traveled to Malakand went there as part of a security advance, as is standard procedure. They had the proper documents and permission from the Pakistan Ministry of Affairs to travel there, despite what the local media is reporting and now blogs such as yours. https://www.emptywheel.net/wp-content/uploads/2016/07/Logo-Web.png 0 0 Jim White https://www.emptywheel.net/wp-content/uploads/2016/07/Logo-Web.png Jim White2012-06-05 10:47:332012-06-06 07:07:07Armed US Diplomats Detained at Peshawar Toll Booth: What Was Mission? It doesn’t sound like typical State Department folks with “four pistols, four SMG rifles and several ammunition magazines in their possession”, but I suppose that duty in Pakistan is a wee bit different than say in in Britain. Nevertheless, did these US folks really believe that they could make unauthorized and unobserved trips around the country and not have Pakistani security forces tagging along? “Pakistan on Tuesday summoned US Charge d’Affairs Ambassador Richard Hoagland to the Foreign Affairs Ministry to convey the government’s concern regarding drone strikes in its territory. Hoagland was informed that the drone strikes were unlawful, against international law and a violation of Pakistan’s sovereignty. The Charge d’Affairs was told that the Pakistani parliament had emphatically stated that they were unacceptable. Drone strikes represented a clear red-line for Pakistan. A second and separate demarche was lodged with Ambassador Hoagland on the seizure of unauthorized weapons that were in possession of US diplomats in Peshawar. The United States is highly confident that al Qaeda Number two Abu Yahya al-Libi was killed in a CIA drone strike in Pakistan, in what an official described Tuesday as a “major blow” to the group’s leadership. The official told AFP that Washington had a “very high degree of confidence” that al-Libi was dead, and argued that his demise would severely hamper the capacity of core al Qaeda leaders to liaise with affiliated groups. “It is significant,” the official said, terming the killing of al-Libi the most important blow against al Qaeda since US special forces troops swooped into Pakistan last year and killed al Qaeda leader Osama bin Laden. I am the Public Affairs Officer at US Consulate General in Peshawar and I can tell you exactly what the “mission” was. It was to organize an inauguration ceremony for an English language program at Malakand University. This program gives scholarships to economically underprivileged students to participate in a 2-year intensive after school program to improve their English skills, thereby giving them a better chance to pursue higher education and secure a better job in the future. The Americans who traveled to Malakand went there as part of a security advance, as is standard procedure. They had the proper documents and permission from the Pakistan Ministry of Affairs to travel there, despite what the local media is reporting and now blogs such as yours. The work the US State Department is doing in this country is incresingly difficult and dangerous. And this work is not secret, clandestine, or subversive. It is legitimate public diplomacy outreach. The publication of conspiracy theories such as in this blog only make our work that much harder. @Marcia Anglarill: Thanks for that information. The history for folks such as Raymond Davis makes thoughts like those I put forward possible. “Armed diplomat” an oxymoron, right? Why might that be, I wonder? Your work is becoming harder and more dangerous because of our military attacks, not because of a relatively obscure blog. The very idea is laughable. I’m just sure some parent in Pakistan whose child’s limbs have been blown off by one of our bombs is thinking to themselves… “you know I really liked the US State Department’s work in my country until I read Emptywheel”! the explanation you offer is simple and credible. what you term “conspiracy theory”, a term insiders like yourself and “wise” journalists love to use dismissively, i call guessing what the american government might be up to. i regard laying out guesses, including unflattering-to-the-gov’t guesses, as a citizen’s obligation when dealing with a gov’t so dishonest in its public statements – domestic as well as international – as the american govt has been over the last 12 yrs. you can’t be unaware that the only reason you wrote to this blog was because you had a clear p.r. gotcha – “we were just going about our ordinary consular business”. i don’t recall your providing a simple, believable explanation to any public media including this blog, during the entirety of the raymond davis fiasco. would you care to enlighten the american public now? if so, i’m confident your comments here on the davis issue would be as sincerely welcome as your explanation about the mission to malakand university have been. my appreciation to you and your colleagues for your work in a difficult political environment. by the way, jim, thanks for the map. it is simply impossible, absent a map, to make any real sense out of quite a few news stories. i always loved the two maps – one upclose and one wide-angle – that the nytimes featured in its sunday travel section. Zimmerman Bond Revocation & Why Bond Will Likely Be Reinstated When Did the “Signature Strikes” Start in Yemen?